Be remarkable. You can make the “greenest” product on the planet, but unless it solves a significant consumer problem, works or tastes better than anything in the market and offers a good value in ratio to price, consumers won’t buy it. Be green because it’s something you value, not as a marketing gimmick. Can coal really market the industry as being green and clean? What is Kermit the Frog doing with the Ford Escape? People smell falsehoods, and you go from bad to worse. Don’t be bashful. A lot of truly “green” companies are afraid to speak up because it feels too self-righteous. Consumers actually appreciate your efforts, no matter the size, as long as they’re earnest and a step in the right direction. The amplification of your message can increase with your commitments. Make it fun and engaging. Green doesn’t have to be staid. The average consumer doesn’t even know that the “hip” home cleaning products (is that an oxymoron?) made by Method are even green. And that’s entirely the point. This fast-growing brand wants consumers to love its product first — because they’re well-designed, smell beautiful and work well. They’re also planet friendly. Method’s attitude is: Why wouldn’t they be? Partner with an established nonprofit. When Kettle Foods wanted to add a cause element to its new Backyard Barbecue flavor, it immediately thought of wildlife habitat protection because it’s something it does in its own backyard. To inspire consumers to apply the same principles at home, Kettle partnered with a respected nonprofit, the National Wildlife Foundation. Then it encouraged people to get involved by creating their own backyard wildlife habitats. Who wouldn’t want a bag of free chips as thanks for attracting local birds? Invite consumers to join you. A flushable diaper doesn’t sound like a product that would inspire a cult following, but gDiapers realized early on that its core consumers were a vocal bunch. So gDiaper empowered them. By creating gMums and gDads, the company arms independent, trusted “spokespeople” with free product and the tools they need to spread the word. Doesn’t get much better than that. Move beyond green. Green is a fad. Sustainability is continual improvement. If you’re only looking at energy consumption, you’re just scratching the tip of the iceberg. Businesses that endorse a “triple-bottom-line” approach — Organic Valley Farms, New Belgium and Clif Bar, to name a few — also address their affect on society in their communities. Environment is the third leg of the stool, but without the other two, you wouldn’t have a place to sit. Please click here to access the entire article. There has been increasing news coverage of alternative energy, most notably due to the explosion in energy prices over the last couple years. I saw two interesting articles over the last day, one from the conservative editorial pages of The Wall Street Journal, and the other from The New York Times. Please note – photo courtesy of The New York Times (photographer: Christinne Muschi). The WSJ opinion piece points out that one of the key barriers to growth in alternative energy is infrastructure, most notably transmission lines connecting the sources of energy (wind and solar fields in rural and desert locations in the plains and Southwest) and the cities in which most people live. The WSJ, in it’s characteristic fashion, blames this challenge on liberals, who they claim support alternative energy but oppose the construction of transmission lines, as they often have to go through protected lands. Here’s a link to the piece. The Times describes challenges and conflicts of interest that have arisen in upstate New York, where wind revenue has become critical for family farmers. The article highlights instances when local town boards have voted on wind leases for firms when several of the individual members already had contracts in place for their own farms. A key issue, the article goes on to discuss, is that there is no statewide (New York) law on wind power, so it is up to the individual towns to decide. Here’s a link to the article. If alternative energy is to become more widespread (according to the WSJ, wind only provides two-thirds of 1% of electricity generated in the U.S., and solar one-tenth of 1%), there will have to be better statewide and national legislation that fast tracks the development of wind farms, solar fields, and other energy sources. At the same time, a balance has to be struck between speed and careful examination of the intricacies of development (impact on local environments, costs, etc). Nevertheless, it is no longer debatable that these technologies are needed. In fact, weaning our country off of foreign oil and developing better domestic, renewable (and clean) energy resources are key elements and ingredients to the future success of our country. My sincere hope is that the right balance can happen in order to unlock this power and bring jobs to local markets with it. I read a very interesting article in the Boston Globe last week, which discussed the rising tide of “green” initiatives at colleges and universities across the country. Campus green initiatives have become so mainstream that even The Princeton Review has started rating schools on their respective commitments to the environment. 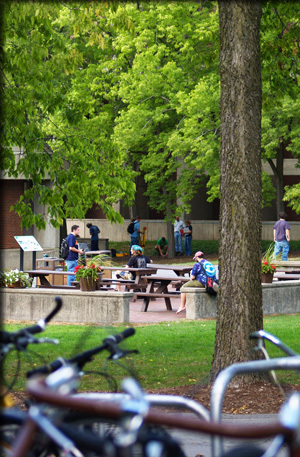 For more coverage on the Princeton Review survey and commentary on the explosion of green campus initiatives at colleges, please see an article from the most recent Education Life section in the New York Times. The Education Life section (published Sunday, July 27) had several other articles on green topics that may be of interest to you. Here’s a link to the section itself. A key takeaway I had when reading these articles was that even if a school has a sterling commitment to the environment, if it does not clearly communicate its good work to the community it large, the impact on its applications, donations and goodwill generated will be muted. Therefore, it is critical that schools get the message out to their constituents (through their websites, social networks, and printed marketing materials, among other channels) that they are firmly committed to sustainability. Whether the printed versions of these materials are made with wind power or printed on post-consumer recycled paper, it is important that these green initiatives are translated onto the printed page. For more on green printing recommendations, please see a post I wrote earlier this year. Hi all – my last post on Tom Friedman’s op-ed, and the traffic and links from all of you, got noticed by his publisher, Macmillan. They contacted me yesterday with an offer for readers of Sustainable Ink. 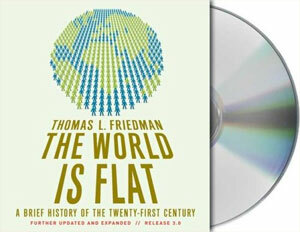 From now until August 11th, they are giving away the audiobook version of his bestseller, The World is Flat, online in anticipation of his new book Hot, Flat, and Crowded: Why We Need a Green Revolution — And How It Can Renew America. You will also receive an exclusive audio excerpt of his new book well before its September publication. As someone who’s read The World is Flat, I definitely recommend it, and this is a way to get it for free.